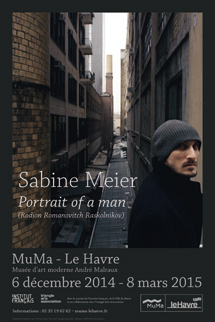 "Portrait of a man (Rodion Romanovitch Raskolnikov)" is the photography work resulting from the "Le Havre-New York, Regards croisés" residency, first produced in New York (October-December 2011) and then in the artist's studio in Le Havre (August 2012). This set forms a photographic portrait of Rodion Romanovitch Raskolnikov, the protagonist of Dostoyevsky's novel, Crime and Punishment. The novel, which describes a double murder and its physical and psychological consequences on the murderer Raskolnikov, follows the painful development that ends in unexpected salvation. "All I could remember about the novel was Raskolnikov, whose mental space was constantly shifting, someone who walked and walked some more, who went around in a sleepy daze as much as he ruminated to the point of exhaustion. Fell and got back up [...]." Although one could speak of photographic adaptation, this is not a faithful reproduction of the novel's narrative. Rather, it can be seen as the actual portrait of the main protagonist. In New York, Sabine Meier found the fictional levers she needed in the modulation of space and light. But the studio photographer had to adapt her work methods to the city streets with lightweight equipment and rapid shots. These very streets were where the artist found three of her models, bringing the novel's characters to life. Benjamin George Filinson, her Raskolnikov, agreed to join her in France to pursue the project. In the second part of her work, the artist built a modular decor in her Le Havre studio, recreating the Dostoyevsky hero's room as a reflection of his constantly metamorphosing mindscape. A series of spaces, reduced to simple signifiers, a chair, a door, a window, a hallway, a wall with trompe-l'oeils of other prior views printed on canvas sheets, following her usual mode of operation. The first instalment of the "Portrait of a man (Rodion Romanovitch Raskolnikov)" exhibition, held at MuMa, is composed of 86 colour photographs, a slideshow of approximately 230 photographs shown on a video projector, and a book, the writing of which was entrusted to an author. "I edited the slideshow in an almost cinematographic manner that followed the fictional development of Dostoyevsky's character. Some images function as a series, others in isolation." This exhibition is totally consistent with Sabine Meier's artistic endeavour over the past several years, in her exploration of the body as it relates to image: "If the model moves the photographer and, within her, the desire to take photographs, is it not because the model's body is mutating, a body in the process of becoming an image?" These images that attempt to grasp the fragile, sometimes hollow, presence of a body, can in no way be seen as anecdotal, for they continually question the presence of the being in the world.